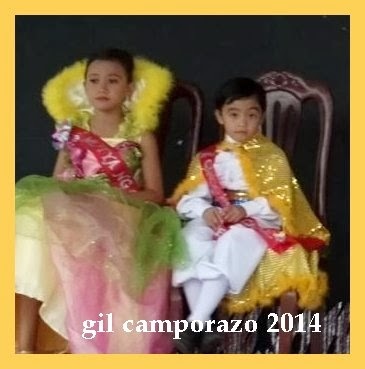 Crowned as Ginoo at Mutya ng Cubay Elementary School 2014 are Matt Xyience Cabuguason of Preschool and katrina Camille Precioso of Grade 2 respectively. Their court was composed of Mary Joy Siando and Adrian Carlos Leganada as first runner up, followed by Werma Alpas and Renz Jay Fieldad, 2nd runner up, then Eula Joy Ferrer and Joemil Samson, 3rd runner up. The members of the court were Ann Marie Diso-asido and Mhel Gerry Necesito as 4th runner up, then Merry Lyn Pilar and Kean Magapuro, 5th runner up, followed by Regine Jacildo and Avelino Flores, Jr., 6th runner up, and Jay Ann Perez with Rowson John Cabuguason as 7th runner up. Their entourage was composed of cape bearers represented by Silka Jane Dionisio and Monacielo Skye Cabuguason, the sash bearers assigned to Margarette Nicole de Castro and Teudy Emanuel Mogar, and the bouquet bearers were Andrea Faith Pitogo, Lorraine Joy Oliveros and Sandy Juanica. Mr. Allan Marabayles, head teacher of Miguel Mondia Elementary School, did the honor of proclaiming the reigning Mutya and Ginoo 2014 of Cubay Elementary with his inspiring, euphemistic words of praising and describing the unique attributes of the kids as compared to the popular and famous local celebrities of the country. 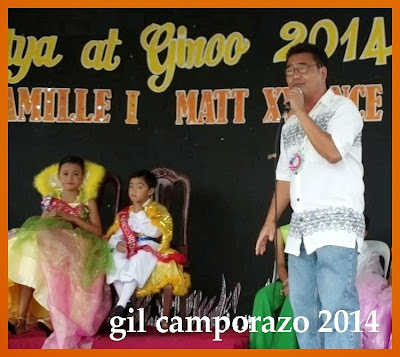 The school principal did the honor in giving the recognition to all that supported the annual coronation of Mutya and Ginoo of the school usually held during the annual fiesta of Brgy. Cubay, La Carlota City. It was the best playground demonstration the pupils did earlier while the afternoon rain gradually kept on falling, the principal noted. Nevertheless, the music and dance presentation of the pupils remained undisturbed. The parents, Tita and Tito, the guardians of the pupils were more excited than the school children. The fiesta was celebrated which everyone enjoyed. 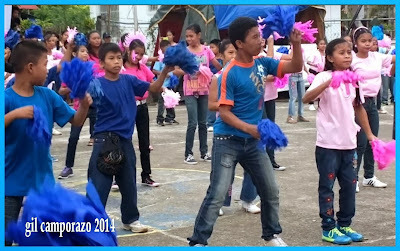 The principal told that the pupils were more blessed for this event as compared to those school children who had been affected by the super typhoon Yolanda in Tacloban. Those victims were still in the process of recovery. He shared the latest weather update of the low pressure area when fully developed would be named "Agaton" believed to be another super typhoon in the making and it is stronger than "Yolanda". The money spent, the burden and anything we did for the success of the annual affair of the school were just nothing compared to the indefatigable efforts contributed by everyone and the happiness which is immeasurable. The success of CES activities were attributed to the concerted efforts of the stakeholders like the PTA led by Mrs. Racquel D. Angellitud, the Barangay headed by Brgy. Capt. Noel C. Vargas and the school committee assigned for this activities particularly the teaching force of the school composed of the following teachers: Mrs. Jossie N. Alesondra, Mrs. Lelanie P. Suyo, Mrs. Nona A. Palanog, Mrs. Maria Luisa Y. Niere, Mrs. Herlene B.Bravo, Mrs. Melanie C. Reyes, Mr. Mario A. Malacaman, Mrs. Mary Ella A. Amar, Mrs. Jema B. Esparagoza, Ms. Gemma D. Salazar, Mrs. Ofelia N. Ayungon, and Mr. Edgardo S. Amar. The school management headed by this school principal is expressing their sincerest thanks and gratitude to all the parents, muses and consorts who have shared their time, effort, and financial assistance in making this activity successful. More power and more fruitful days ahead and more activities in the next school year. The post you have made here is good and informative. I like it well. Expecting same from you here again.